Teddies Spreading Goodwill Across the World. Over 8,000 Teddies spreading happiness around the world. Over the past 7/8 years the Club through Elaine Turner and her knitters have produced over 8,000 knitted teddies which have been sent all around the world. One of the recent consignments has been sent to Mercy Ships a medical ship servicing West Africa where they are being used to speed up recovery of young children who have just received surgery. In many cases the teddy is the first toy they have ever had. You can see the joy they show in receiving them. Over the past 6 years the Lutterworth Rotary Club, through Elaine Turner and her dedicated team of knitters, have supplied a range of charities throughout the world with some 7,450 knitted teddies. These are distributed by the local communities to traumatised, orphaned or young children starting school for the very first time. The children would now have a toy of their own, a teddy to enjoy and “confide” in. The recent consignment being received by the Little Faces School in Mombasa, Kenya. The picture shows them being received by the first year kindergarten children, who have just joined the school after Christmas, and have just received their ‘welcome’ knitted teddy [& toothbrush] that had travelled all the way from Lutterworth. They had been supplied by Elaine & Sue Turner & their legion of knitters and sent to Kenya through Sally Harrison [Rotary Club of St Neots] and her Little Faces team. Sally wrote: ‘The children had been very quiet until they got their bears! Most of these kids have never had something special of their own. What a difference a comforting gift can make. 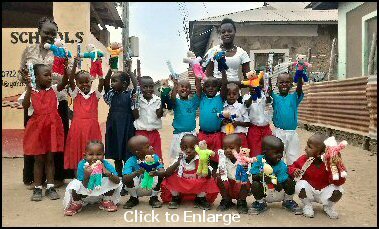 Children from the Little Faces School, Mombasa, with their Teddies from Lutterworth. Good News - At the end of October, 2018, we have now reached the 8,000 knitted teddy mark and exceeded it thanks to lots of knitters and distributors. 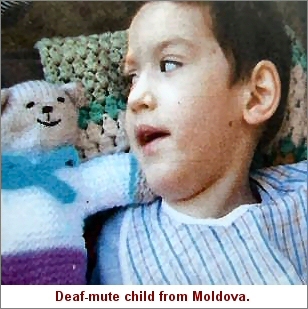 Since a small advert in a Church Magazine back in November 2011 asking for teddies to be knitted for children in disaster areas of the world or in trauma we are now exceeded 8,000 that have been distributed to 29 different countries by many individuals and organisations. And we are still receiving requests for more. Teddies have been knitted by groups and people knitting alone. It is amazing to see photos of so many children bonding with the teddies and a special thank you to all near and far who have made this project so worth while. The latest batch is going to (Love in a Box) organised by Browns of Lutterworth and will be distributed in Easternn European orphanages in Moldova and Ukraine. Others are on their way to Mumbai and hopefully Haiti and one hundred are being sent to Wirksworth for inclusion in Rotary Aquaboxes. Australia - Chile - Denmark - Easter Island - England - Ethiopia - Ghana - Goa - Kenya - Malawi - Moldavia - Mumbai - New Zealand - Northern - Ireland - Peru - Portugal - Romania - Scotland - Sierra Leone - South Africa - Syria - Taiwan - Tanzania - Turkey - Ukraine - USA - Vietnam - Wales - Zambia. 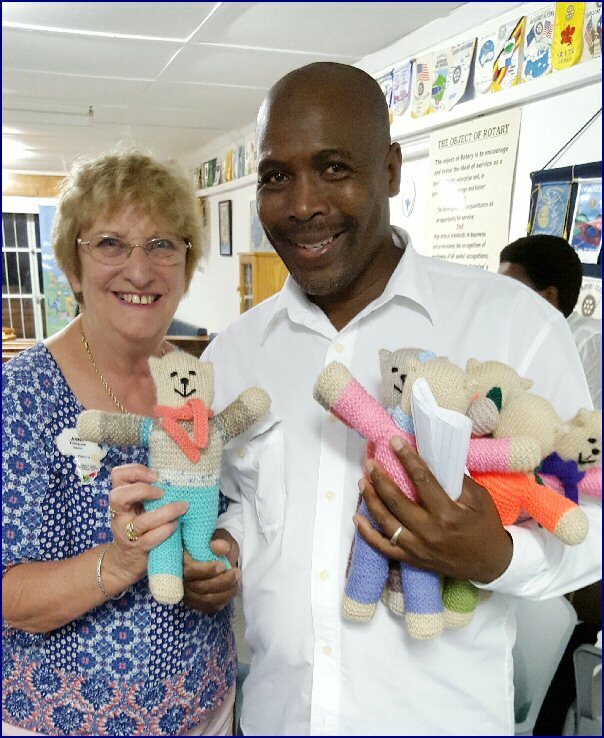 Anne Thompson Rotarian (sister of Lutterworth Rotarian, Rose Chapman) and Director of a local children’s home in South Africa receiving Teddies for the children.